The history of South African wine remains a riddle wrapped in a mystery inside an enigmatic empty bottle of GS Cabernet 1966. Charged by the pink-liberal crusade of Zackie Achmat who had an innocent Cape Town restaurant called Haarlem and Hope change its name due to some looney left theory that the good ship Haarlem was a cesspit of slave-carrying tyrannical colonialism, I want to ask whether we really know when wine was first made in South Africa. Of course, 2 February 1659 is accepted as being the date when Jan van Riebeeck claimed must to have been pressed from Cape grapes. Could this, however, be some pulling of colonialist wool over our eyes? Recent research and intellectual discussions with a Xhosa gardener and three petrol-pump attendants has got my liberal hormones pumping, asking whether the industry has not ignored the existence of wine having been made in the Eastern Cape since around the 1400’s? How white and colonial to think that this mighty land of civilisation versed in centuries of culture, cattle-grazing and tribal wars had to wait for a bunch of Dutch traders to create history of wine-making? One settler, one corkscrew through the scrotum. The fruit of Rhoicissus Capensis. Besides offering strong woody tendrils upon which to fly through the woods looking for Jane, the Rhoicissus Capensis also bears bunches of large, juicy berries which when removed will have anybody convinced they are grapes. Hence the plant’s other name “wildedruif”. Beck was discussing this wild Cape vine and its fruit after the legendary Louis Leipoldt, poet, author and wine and food writer, had once written about the wine he had tasted which had in fact been made from this Rhoicissus Capensis, a wine he remembered as having a particularly “strong bouquet”, obviously the result of the high acidity. Acidity which in Leipoldt’s days could not so easily be adjusted as the case would have been today. Particularly if it was made by some toothless forest hillbillies in Knysna permanently zonked on ape-weed. Even the leaves are vine-like. 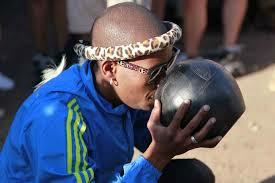 So, here we have an indigenous South African grape-like fruit and documented proof that wine had been made from it. Onto my good friend Dubula Mamela from the Stutterheim region in the Eastern Cape. Having seen the piles of empty bottles leaving my abode, he one day asked me why Xhosa wine is not on the market. 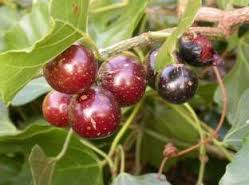 And tells me that yes, in the Eastern Cape the fruit of the wild grape – iDiliya in isiXhosa – is not only a sweet and refreshing edible, but is often fermented in clay vessels. Sometimes with sorghum, but also in its pure, berry form. The clay vessels are left in the sun for a few weeks where after the juice is poured off, cleaned through a blanket and then consumed by the men while strenuously sitting around the clay huts watching the woman de-weed the maize fields. Slow day at a Xhosa Wine Tasting Society. Not being that hot on record-keeping, there does not appear to be any documented evidence of this in Xhosa custom. But if there is in fact a vinous culture among the rural Xhosa folk, it may very well be that wine was being made in South Africa 200 years before Jan van Riebeeck set foot on local soil. The Xhosas settled in the Eastern Cape in 15th century and it would not have taken them long to discover the local grapes and begin some experimental vinification. The wild grapes ripen around June, and I have given Dubula permission to hot-foot back to his relatives in August to pick-up a gallon of this wine when the fermentation and filtering should be finished. The industry elders would no doubt not enjoy this rewriting of history. But if wine is indeed an embedded part of black culture, it could just give local consumption the boost the industry is looking for. Rhoicissus Capensis might be hell on a wine label, but there’s always Amandla Rouge. I’m pleased you’ve raised this. When I was researching my book I tried to find out if anyone had made wine from it but I had no success, no one I asked showed any interest in the subject , and I never found this vine growing or have seen the berries. With all the wine-making expertise, the university and viticultural and winemaking colleges in the Cape I’d have thought someone would — in the spirit of research — played with this native berry. And, considering rooibois tea that I’d never heard of before my first visit in 1996 and was poured for me by my Afrikaaner hosts is now found in shops all over the world, maybe just maybe….. Thanks for your comment. Such an exercise would be interesting, if nothing else. I am looking to source some of this wildedruif next year to give to my wine making buddies to play around with. Who knows…..! A good story it is. You might be barking up the wrong vine here. 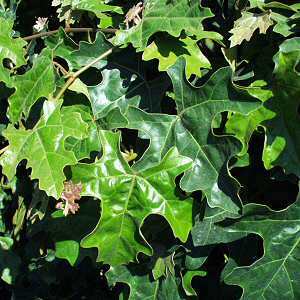 The leaves in your picture don’t resemble Rhoicissus tomentosa which is the correct name for R capensis. Ask curator Martin Smit of the Stellenbosch Botanical Garden to show you the wildedruif or bobbejaantou in situ. Also keep in mind that they are shy bearing – you will need a mini forest to supply enough juice to fill a barique. Thanks Fritz. Will take that into account when tackling the forest with my team of harvesters.